There are over a dozen Box Canyons in California; this one is a colorful ravine through the Mecca Hills at the east end of the Coachella Valley in the southeast corner of the state, 40 miles from Palm Springs. The sides are formed by upturned strata - twisted, buckled and eroded, they stretch for about eight miles along the canyon, which is part of a metamorphic zone associated with the nearby San Andreas Fault. This runs through the Coachella Valley then southeast past the Salton Sea, and affects the geology of a wide strip of land at either side. A scenic, lightly traveled road (CA 195) runs through the ravine, linking CA 111 with I-10 and continuing northwards into Joshua Tree National Park. 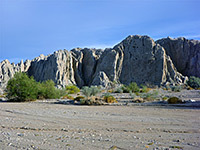 Plant life is limited to scattered bushes and palo verde trees along the sandy valley floor, as the jagged rock walls are completely bare. 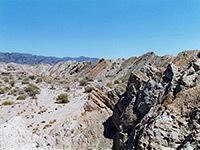 The surrounding hills contain other narrow ravines, some of which become authentic slot canyons, plus springs, oases and a large area of vividly colored badlands; one other quite well known location is Painted Canyon, reached by a 4 mile gravel track (with soft sand in places) leading west off Box Canyon Road, which has impressive rock formations in shades of pink, orange and red and grey. 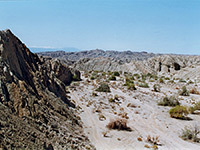 This particular ravine leads into the heart of the Mecca Hills Wilderness Area, a 24,000 acre preserve created by the 1994 California Desert Protection Act. Some of the best slots in the area are east-side tributaries of Painted Canyon. It only takes about 15 minutes to drive through the interesting part of Box Canyon, after which the highway crosses the much more open Shavers Valley, and although there are no official trails, several days could be spent investigating the surrounding country. There are various places for camping by the roadside - good locations to stay but often with quite a lot of litter.